Fashion Icons – Part 3 | Oh, for the Love of Vintage! If you’ve read the first two parts of the ‘Fashion Icon’ series, then you realize that all of my fashion icons are fictional characters. It’s impossible not to be influenced by all of the things I collected while growing up like dolls, comics, pin up illustrations and books. Today I’m going to focus on one of my all time favourite characters, the incredibly clever and fashionable girl detective Nancy Drew. 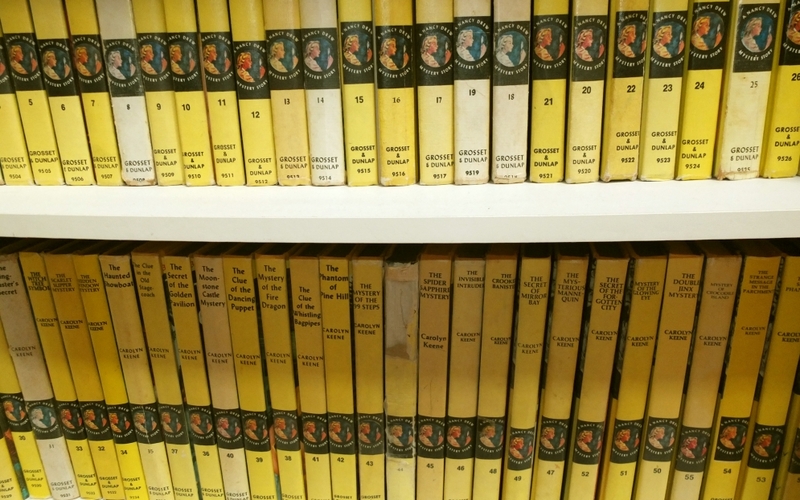 I started collecting Nancy Drew books when I was nine years old and I still collect them to this day. I have what is referred to as the ‘yellow spine books’ series twice over. Why do I have the complete series twice you ask? Because in 1956 the stories were revised and I wanted to have the original story and the revised version in my collection. With my collection of the ‘yellow spine books’ complete, I now focus on collecting the original books with dust cover jackets, 1930 to 1956. I prefer the original version of the stories, as I’m sure a lot of readers do. In the revised stories of 1956 and onward, Nancy Drew’s character was greatly altered and the stories became more moralistic, preachy and hyper politically correct. 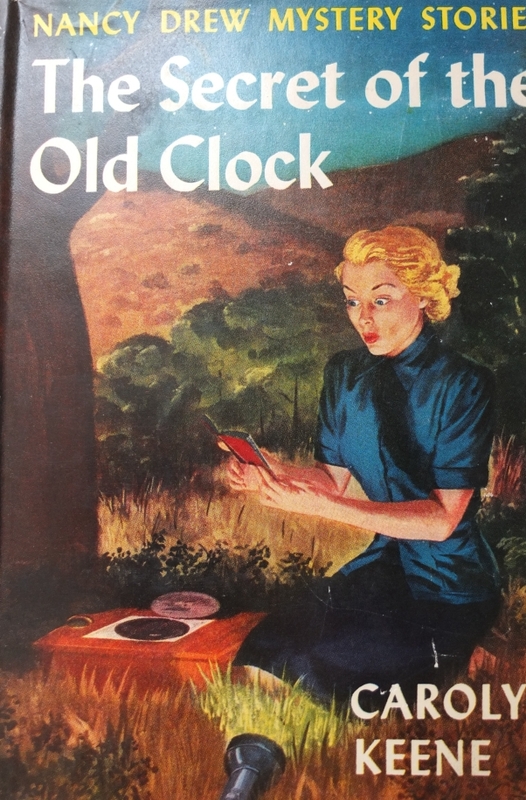 The first Nancy Drew book, The Secret of the Old Clock, was published in 1930 by Grosset and Dunlap. 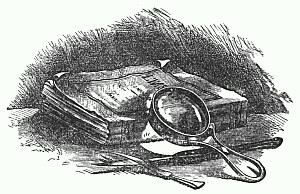 Nancy Drew was created by the publisher Edward Stratemeyer. 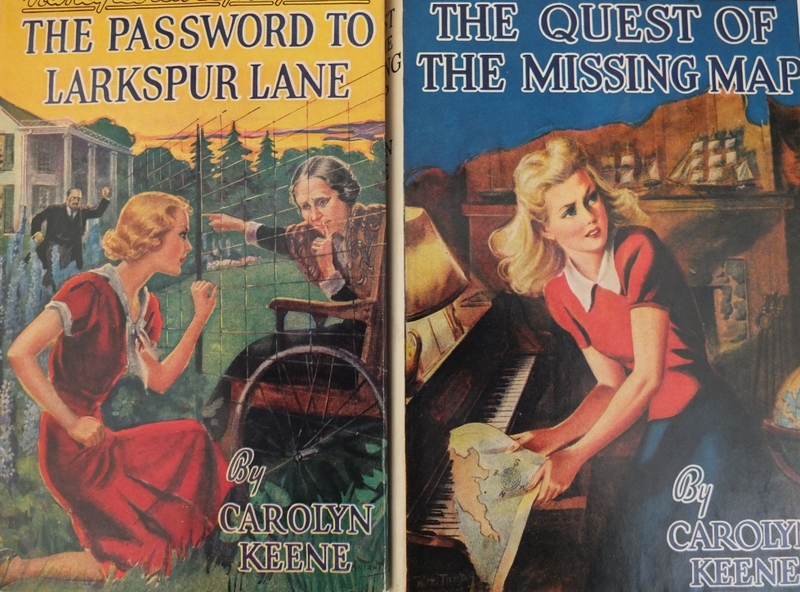 The name given to the author of the series was ‘Carolyn Keene’ who in reality, like Nancy Drew, does not exist. Several different ghost writers wrote the Nancy Drew books including Mildred Wirt and Walter Karig. After 1956, the revised stories were written by Stratemeyer’s daughter, Harriet Adams. This explains the glaring discrepancies one can find in the series. Details change or are forgotten, because the authors didn’t seem to keep track of each other’s work! 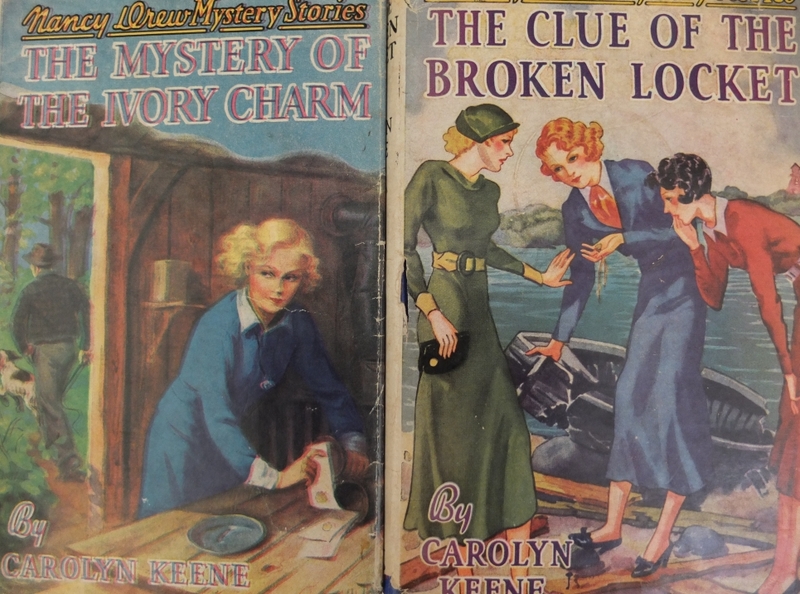 If you’re a collector of Nancy Drew books, you know exactly what I mean when I say she was a true fashion icon. Whether you wear 30s, 40s, 50s, or 60s fashions, Nancy was the epitome of style in all of those decades. Nancy always had the sharpest suit, latest hat or most fetching party dress (much to the annoyance of her friends Bess Marvin and George Faye perhaps). ;0 Maybe Nancy’s father, attorney Carson Drew, gave her a very large clothing allowance! Let’s take a closer look at Nancy Drew and unlock the secrets to her enduring fashion success! In 1938 the series was made into a hit film, Nancy Drew, Detective, featuring Bonita Granville. Due to the popularity of the film three sequels were made. A few years ago I bought this collection on dvd. I have to admit – I love it! If you’re a Nancy Drew fan, be sure to check the series out. 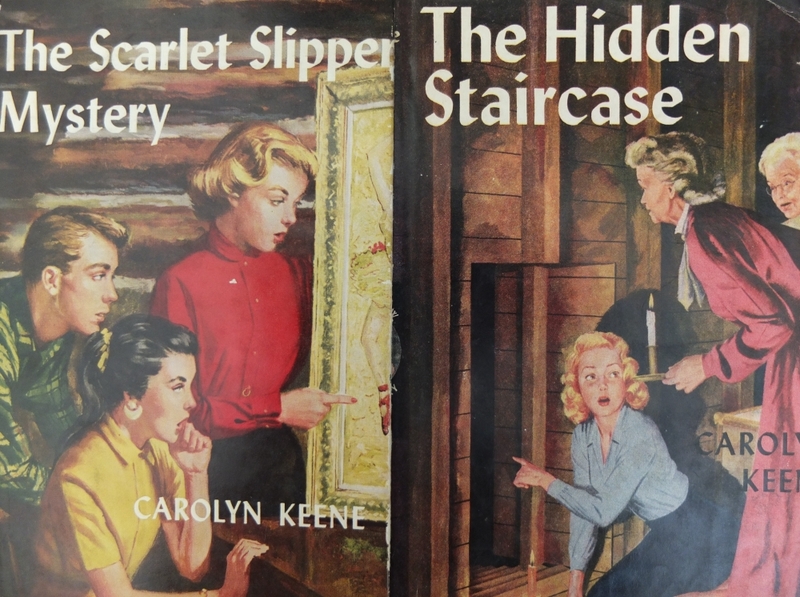 Did you use to read Nancy Drew books while growing up? Do you collect them? Let me know! 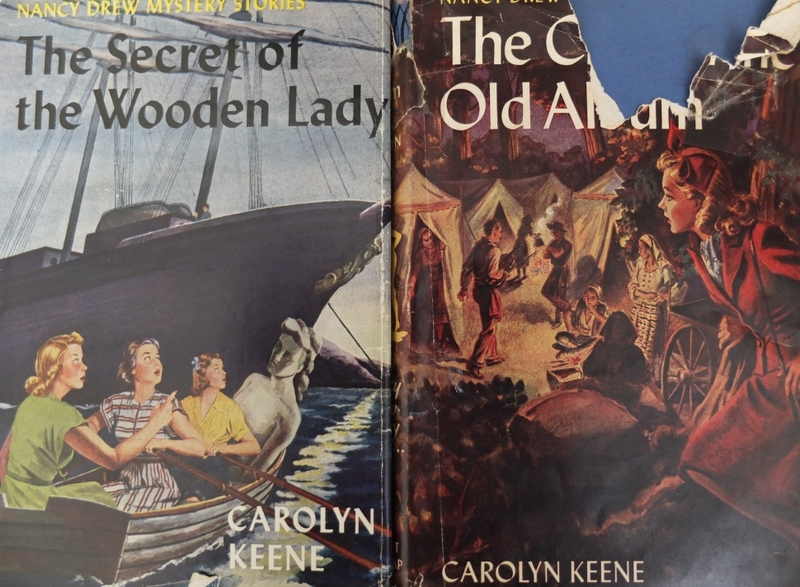 I don’t collect them, but your post reminded me of the many hours I spent with the Nancy Drew books as a young girl. What a fantastically fun post. My mother had a hefty stack of these yellow spine classics when I was little and I poured over each and every one, always greatly enjoying the cover art and Nancy’s vintage style. I’d never stopped to think of her (Nancy Drew) as one of my founding vintage fashion inspirations, but now that I think about it, there’s no doubt that she was. Wishing you a stellar Tuesday, dear gal! Pingback: Fashion Icons – Part 4 « Oh, for the Love of Vintage! 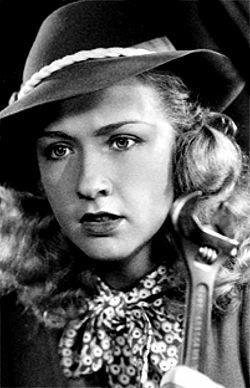 I remember reading Nancy Drew books at High School, but I’ve as yet to see Bonita Granville as Nancy Drew, although I now have ordered the DVDs. I have now started to re-read them from the first book through the series, and have got to the 5th book so far, and hoping my daughter will begin reading these books too! « Winner of the Prize Giveaway to Mark 100 followers!